Review Harry Potter author proves she can write for adults, but don't expect a happy ending. It starts with a death, and ends with a chilling tragedy. 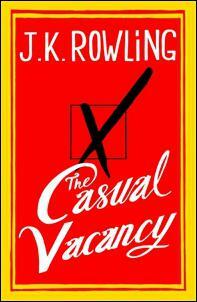 JK Rowling's first novel for adults, The Casual Vacancy, poses the big question: can she make the transition to writing for grownups? The answer, after whizzing through it in a single day, would have to be a resounding yes. She cracks briskly into the narrative with the death in a carpark of Barry Fairbrother, a middle-aged nice guy and councillor for the West Country town of Pagford. Barry's death brings all sorts of repercussions: it forces a "casual vacancy" byelection, which initiates some nasty rivalries. And it leaves those who depended on Barry for his practical forms of kindness bereft. The leadup to the election gives Rowling the opportunity to have a dig at the English class system. The mainly white middle-class citizens of Pagford look down their noses at the residents of The Fields, a filthy council estate rapidly encroaching upon their territory. Not far beyond The Fields is Yarvil, a working-class town also loathed by the Pagfords, and vice versa. The election will give the council the chance to vote on whether Pagford can rid itself of The Fields and associated services, such as a much-needed drug rehab centre. Rowling steers a large cast which can be loosely divided into a disparate bunch of teenagers and a range of adults, deeply flawed and in some cases, despicable. It's the teens who really shine, especially Krystal Weedon, the 16-year-old daughter of Terri, a junkie described as "simultaneously child-like and ancient" whose squalid sitting room has "no books, no pictures, no photographs, no television".